Earlier this month, we stayed at the hotel my husband works at for the weekend. I took some photos that weekend. Click on the images to see more detail. Alaska's flag. I flipped this photo to show it with the North Star in the upper right hand like it's supposed to be. 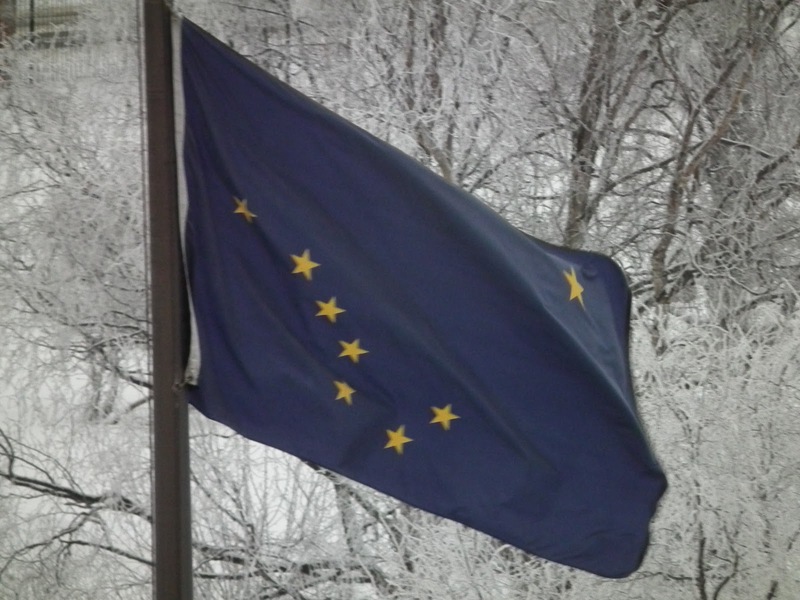 Alaska's flag against all that snowy white! This handsome raven was just perched up there yelling for attention. 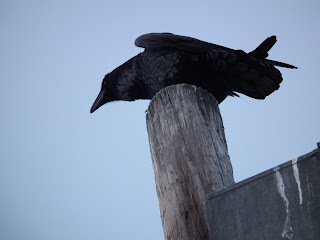 So I took a bunch of photos! Thanks to one of the people on my Facebook friends list, I know this is a a gray-crowned rosy finch. The little sweetie also seemed to love the camera. 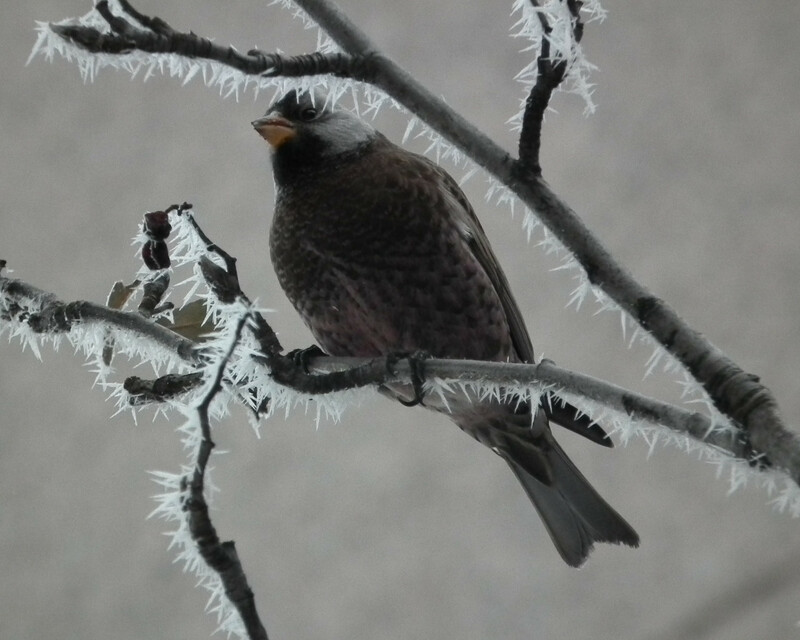 I took a bunch of photos, and really love the contrast between the bird's coloring and warmth and the frost on the tree. 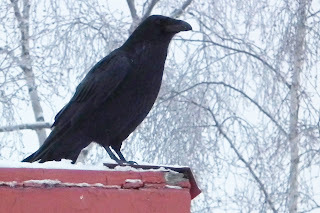 It was munching those berries like a frozen treat! 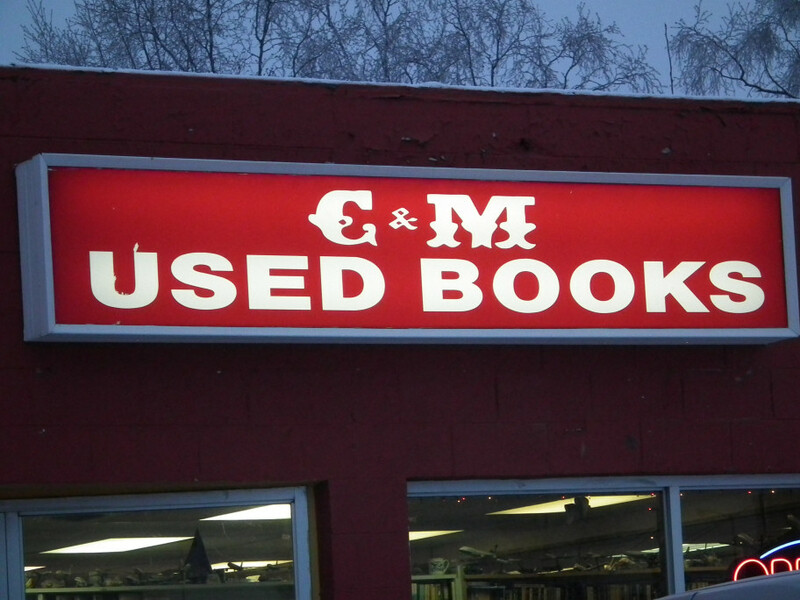 If you ever come to Anchorage, on the corner of 4th and Barrow is a used book store that's been there since I was a kid. 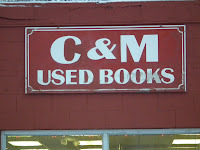 The owner, Cathy, has told me she's not going anywhere because she doesn't want to leave her books. The books! 300,000 or so books in this shop that's been there for so long. They are on shelves with narrow paths between them, in boxes next to the shelves and just stacked by the shelves. Stacks of books surround the front counter area, piled on, behind and in front of the counter. You have to reach across these piles of books to pay her, and she's always ready to talk to anyone who comes in. 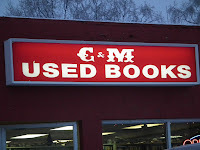 It's called C&M Used Books, and it is the very definition of used book store in my mind. It's the prototype. 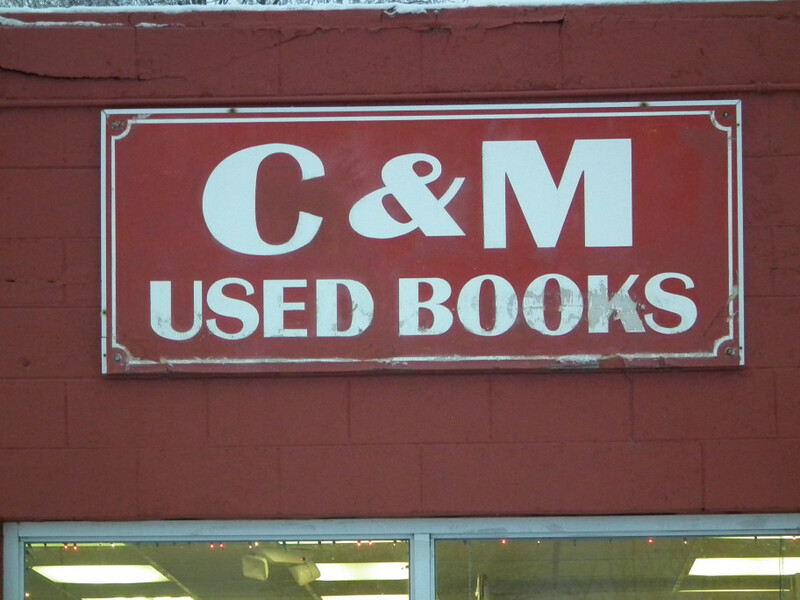 Other than the signs, one old, one new that say C&M Used Books, look for ravens and magpies. She and her assistants toss out their leftovers for the birds, and there are lots of fat, happy ravens and magpies around the store waiting for treats. These two photos weren't taken that weekend, but I wanted to share them anyway. 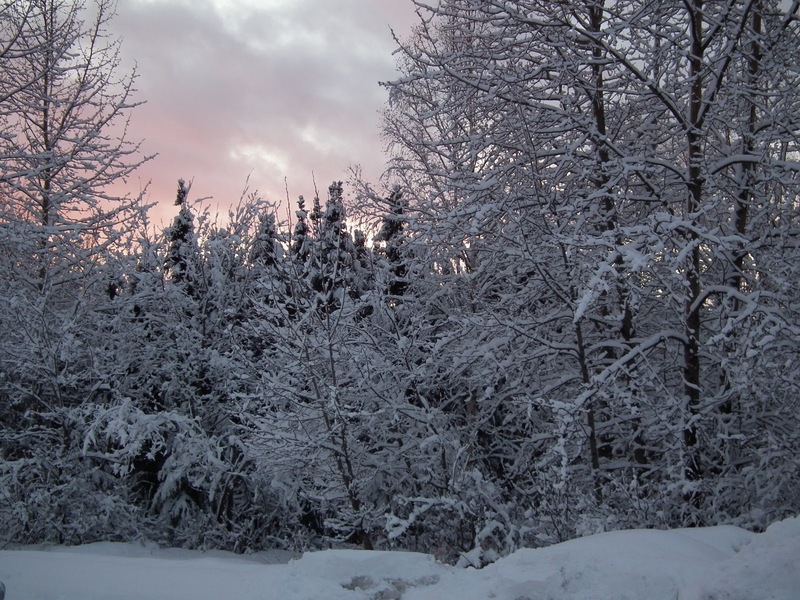 Sunset, at about 3:30 in the afternoon! 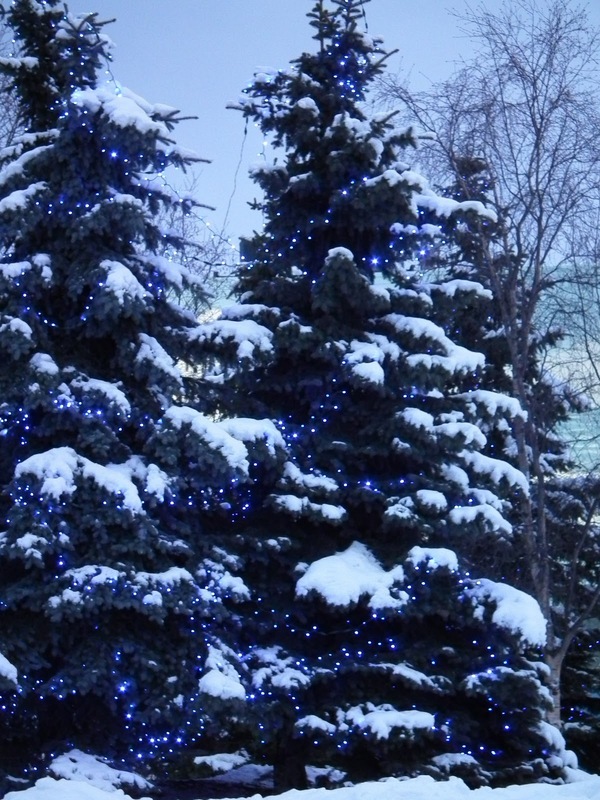 Trees all lit up at Anchorage Town Square.